Killer Characters: Crazy for Christmas? Does your family love Christmas? Mine does. Maybe too much. The level of decorating zeal is so high I find myself hiding out in the sugarhouse at our farm, Greener Pastures as often as I can. It's the only building on the property not festooned with greenery, tinsel and mechanized musical gizmos. I knew as soon as I lied to my mother, the night would turn out badly. Guilt sat in the pit of my stomach like a truck stop burger as I watched the lights of my grandparents’ minivan fade down the driveway. I am not by nature a liar, but if I didn’t get a couple hours to myself, I was going to end up headlining the local news. So I did what any devoted daughter would do and faked a migraine. The holiday season brings on overachieving mania in my family every year. Preparations begin on All Saints’ Day and reach toxic levels of holiday cheer by Thanksgiving. My mother festoons every room in our sprawling farmhouse with porcelain villages, twinkling lights, and creepy animatronic elves. Grandma turns the kitchen inside out crafting mince pies from actual meat, building gingerbread house replicas of famous castles, and challenging Switzerland to a chocolate production duel. My sister composes a holiday newsletter that puts many glossy magazines to shame. The year I was born, my grandfather added a dozen reindeer to our herd of cows and my father built a sleigh for them to pull through the center of town. Readers, does your family get as crazy for Christmas as mine? To show our appreciation for our readers, we're giving away one book each day for the whole month of December. It's our gift to you. Every day one lucky person will be chosen from the people who left a comment that day. You have 31 chances to win! But you have to leave comments! So come back every day and leave a comment for a new chance to win! Jessie loves to hear from readers at her website and on Facebook! I would decorate like your Mom but my husband is just this side of the Grinch. He puts all of the decorations in the attic where I can't get to them so I am still trying to get him to get the ornaments down so I can at leat get the tree decorated with more than just lights! I used to decorate when the kids were home but now that they all have homes of their own, not so much. Merry Christmas! My family's pretty sane. My boyfriend and I don't decorate since it's just the 2 of us. When our families were young, yes we over did everything but, now we more or less just enjoy each others company! Book sounds great! Merry Christmas to all! We do a tree and a few other table decorations but that's it. LOL My family doesn't go overboard. In fact, now that we're all older (my parents are in their 70's) we've scaled back quite a bit. A neat tradition we used to have was a St. Nicholas party on St. Nicholas Day (December 6th). We'd have people over for hors d'oeuvres and Mom would give everyone little gifts. It was really nice, but sadly people weren't very appreciative and she stopped doing it. I used to decorate a lot but since we now go to our daughter's I only decorate outside. Since we have adult, married daughters, our Christmas is not as craxy as when they were younger. 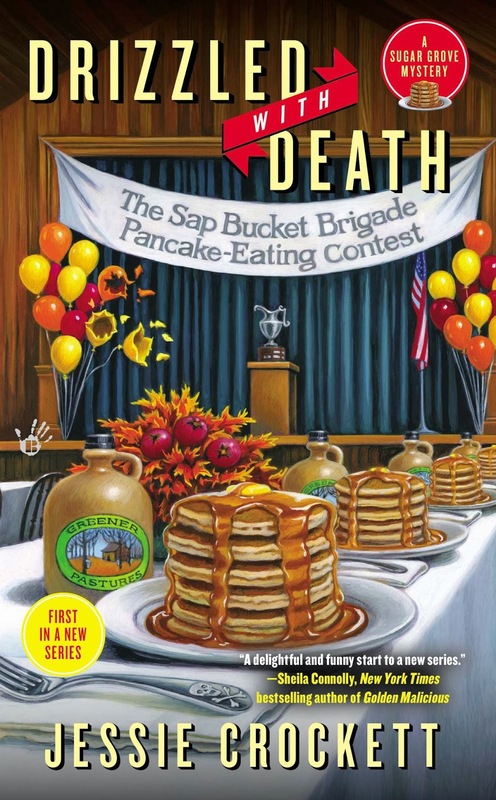 I forgot to say I just finished Drizzled to Death and enjoyed it very much. Looking forward to more in this series. The tree is 10-12 feet tall and the presents fill half the room. Not expensive presents, we just have a big extended family. I have a very large family (counting my siblings and my nieces/nephews). We all get together at my sister's house on Christmas Eve day, and it used to be crazy because we exchange presents with everyone. But, we've stopped doing that, and instead we all just bring a dish to eat and a dessert and have a wonderful meal and get the chance to talk with everyone. It's really nice. It's loud because there are so many people, but very nice. Merry Christmas! We used to go crazy until my daughter went off to college. Now we still decorate but not like we used to. Also out family is much smaller now. Our Christmas is pretty calm, but we enjoy our traditions: shopping, tree decorating and lots of baking! I used to get more carried away but this year I have nothing except a tiny USB tree since we are in the process of moving. I do really appreciate all the lights around town and the decorations that others have put up. I love all the decorations! ElaineE246 at msn dot com. Our children insist they want to be in on the tree decorating. They are in their 20s. But it usually ends up with them not getting it together to do it. So, Dad does the honors. I don't decorate at all. We used to as a family. Now it's just me I don't bother. I used to put the cards out but this year that did not happen. Thought about getting a tree but that would mean decorating it. Guess I am a bit of a humbug. Going to have Christmas by myself as well. Maybe next year. We go a little crazy with putting up lights, Christmas tree. Happy Hoildays!!! I try to stay low key (my family will probably disagree). I always mean to but then I'm all, "Come on, we have to do this, do that..." Of course the most overbaord thing I do is cookies. I marrowed it down to one type of cookie per person but the family kept growing! This year after several snowstorms forced the rescheduling of concerts, plays, basketball games I've decided on a first for me. I am not making Christmas cookies. I am making New Year's cookies. My husband is taking the kids (3) out for the entire day next weekend so I can bake in peace. No, I don't decorate any longer since I don't hostess any events-my house is too small to hold all of the family! Merry Christmas! We all love Christmas. Though over the years we have simplified to make it more joy, less stress. Since it's just me and my hubby we don't do much decorating---we are afraid our beagle would try to eat anything we put on a tree. My family goes all out - we have one real tree, and six artificial trees throughout the house -- along with hundreds of ornaments! We love to decorate for Christmas! We decorate, but the only thing overboard is my mom likes the blow up thingy in the yard so she puts out like 8 of them! Every Christmas Eve we drive around and look at other's lights, so we love when people go overboard outside!! My Mother's maiden aunts and bachelor uncles would go all out decorating at Christmas. Every room in their large house was decorated, even the bathroom. Wish the contests lasted for more than one day because I don't have a computer at home so I couldn't enter over the weekend (or the next two days!). I love the cover of the book. I even have a cologne that smells like maple syrup. I think it's called Sunday Breakfast and I bought it at Target quite a few years ago. I also have a cappuccino-scented one.